What the heck is a telegraph cucumber, I wondered, and of course went straight to Google. Turns out it’s what I think of as an English/European cucumber, the long thin kind that comes wrapped in plastic in the supermarket. This is to protect its thin skin. Several seed companies sell seed for Telegraph or Tall Telegraph cukes; I’m assuming the name has to do with long vines (like telegraph poles), as in the Tall Telegraph variety of pea. Telegraph/English cucumbers are among those grown in greenhouses, to extend the season. They are parthenocarpic: they do not need pollination to produce fruit, and the fruit is practically seedless. I grew a parthenocarpic cuke, Eureka, in the demo garden this year, thinking it would be great to be able to leave it under a row cover to avoid pests. Unfortunately I didn’t plan very well, and one of the plants was placed right next to a cuke that needed pollination, so that row cover had to come off. Besides, the covers were not roomy enough to allow for growth. I also have to master the art of covering a young plant and then getting it onto a trellis as soon as it’s uncovered, before it gets too big and sprawling. Small plant cages that can be covered from the beginning might be the answer. Cucumbers resist disease better when they climb (although they sometimes produce less), and vertical growing also saves space. The reason to cover cucumber plants is to limit the exposure to cucumber beetles. which feed on plants and also carry bacterial wilt, a disease that kills cucumbers pretty reliably, especially in the early summer. Some are striped, and some are spotted (different species). 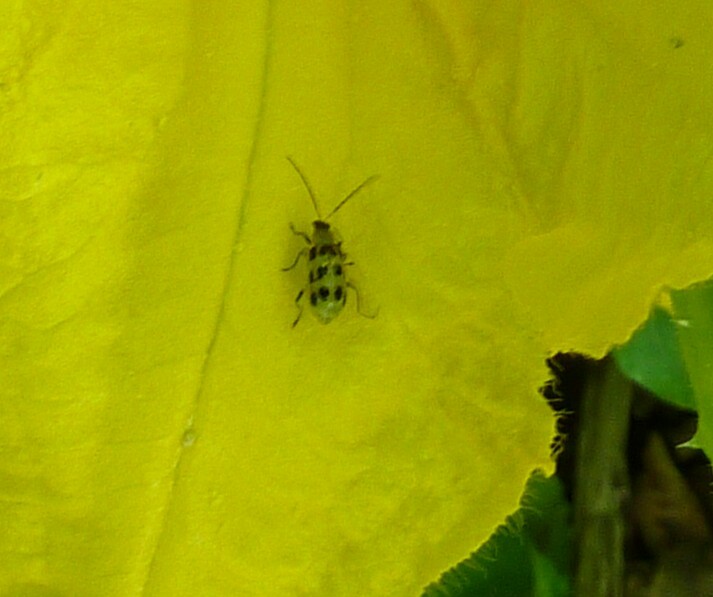 Here’s a spotted cucumber beetle on a squash blossom (they also attack squash). Unlike other plant pests such as potato beetles and squash bugs, cucumber beetles are hard to handpick because they move so fast. And, to quote William Woys Weaver on the pest, “Insecticidal soap only annoys them, and shouting does no good.” If you don’t want to spray your plants with pesticides to keep the beetles away, exclusion with row cover is one of the only choices. However, cucumber beetles are active into the summer months, so uncovered plants will continue to be vulnerable. 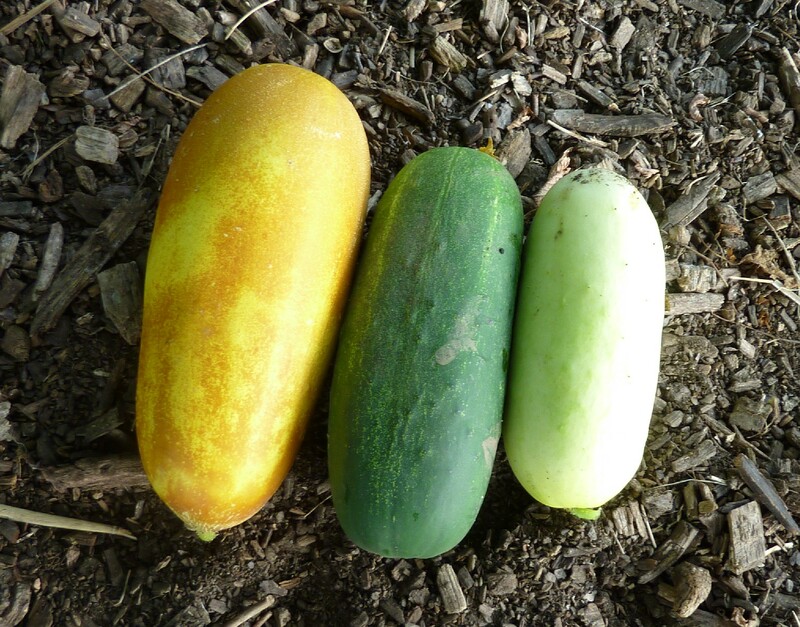 One solution to this is succession planting of cucumbers: starting a new crop once a month or so, either in another location in the garden or in pots (to be transplanted later). This is something I always mean to do and don’t always get to in practice (but I think I can squeeze another crop in this year). Another pest deterrent that may help is growing onions and/or strong-scented herbs among the cucumbers. I don’t think I’ll try growing telegraph cucumbers (until I get a greenhouse!) but it’s fun to try other types beyond the many varieties of green slicer. Little pickling cukes, long bumpy East Asian kinds, round lemon cucumbers and other heirloom types, they all have virtues. We’ve been enjoying the Poona Kheera cukes this year (which are outproducing the Eurekas about ten to one). I like them better small, but the larger ones with brown skin are still sweet and tender, just with larger seeds. The photo at the top shows part of one harvest: more mature Poona Kheera on the left, Eureka in the middle, smaller Poona Kheera on the right. Like the Poona Kheera, cucumbers as a species originated in India, and there are many other varieties from that part of the world to try. Suggestions? I don't have great luck with cucumbers. My parents grow a Chinese cucumber, and my mom makes an amazing spicy pickle from them. I should get the recipe! How nice to have virtually seedless cukes. I remember seeing a whole bunch of “burpless” cukes and was like, what could that possibly mean??! oooooohh! Personally I think shouting can help the shouter even if it doesn't scare away the bugs. But yeah, cucumbers are hard – at least they grow fast! Some people have unfortunate digestive reactions to cucumbers, and some varieties (burpless) provoke that less. Last year I planted Marketmore cucumbers. All of the plants crashed from wilt from those horrible striped and spotted cucumber beetles. This year I planted County Fair cucumbers – reported to be resistant to the virus even though I was told not to expect much. I had to order the seeds on-line since I couldn't find any County Fair seeds locally. Guess what? I harvested 3 perfect cucumbers this morning! I probably shouldn't say this but I haven't seen any cucumber beetles this year. Yea! I will definitely give County Fair a try next year! Even if it only slows down the wilt that would be worth it.